The technology boom of the late 1990s, the accumulated annual doubling of computing processing power and storage, and the rapid growth of the internet achieved a critical mass shortly after the Millenium. All of a sudden, a myriad of new possibilities became available to the designers of products and systems. These possibilities most challenged the designers of mission-critical and life-or-death systems, products and industries where Murphy’s Law creates catastrophic problems. If things came together in the early 2000s, that means there was a whole bunch of activity in the preceding decade that then gave rise to the boom and next-level capabilities. Process-ware always lags technology and invention. Companies don’t know what type of process best optimizes new capabilities until they have achieved a representative sample of experiences, then comes the process. It is no surprise that a Technology Readiness Level assessment methodology emerged after the boom. Its usage rapidly spread across the world. Globalization was accelerating in that same time period and many international companies began doing business together. 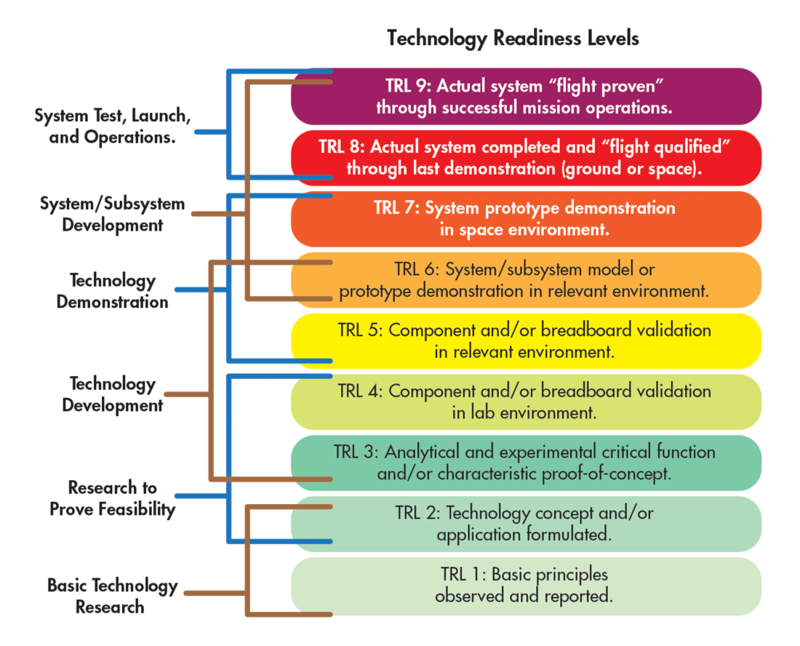 Since 2010, hundreds of renditions of the Technology Readiness Levels figure below (a classical version) have existed, some in the public sector and many private copyrighted versions. Type “Technology Readiness Levels Images” into a search engine and you are sure to find a public version that has been adapted for your needs. With so many countries and industries using and refining the methodology, it was also no surprise that a family of methodologies arose to assure end-to-end management across the places that readiness applied. Practitioners effectively voted that “readiness assessment” was a good idea. And the approach enabled government, defense, systems contractors, and complex systems industries to have natural places to approve, withhold, or kill funding. And off they went. Like QFD’s “Four Houses of Quality,” the increasing refinement had decreasing returns. Most use the First House of Quality and get into the Second House. TRLs and MRLs are the most-used outside of the mission-critical environments. The figure below (a classical version) indicates the dovetailing of TRLs and MRLs. Sandia National Laboratories’ initiative is among the most active places of ongoing refinement in the USA. Europe’s Horizion 2020 [H2020] initiative is perhaps the most active place of refinement in Europe. TRLs and MRLs are highly embedded in many companies and industries throughout Europe and in India; and throughout the US Government and the aerospace and defense industries. 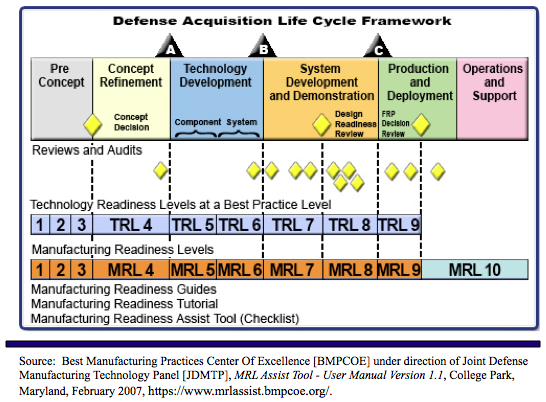 Technology Readiness Levels Are Widely Adopted [Machine Design – May 2017] illuminates the success of TRLs and the family of frameworks that developed around TRLs, including: Manufacturing Readiness Levels [MRLs], Interface Readiness Levels [IRLs], System Readiness Levels [SRLs], and People Readiness Levels [PRLs]. This entry was posted on Thursday, April 27th, 2017 at 11:00 pm	and is filed under Blogroll, Research, Strategy, Tactics, Tools & Techniques. You can follow any responses to this entry through the RSS 2.0 feed. You can leave a response, or trackback from your own site.